Febreze has launched a Super Bowl ad, advising people to party prep with Febreze before their Super Bowl party kicks off. 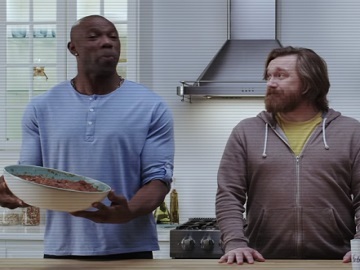 The spot released by the P&G brand features former NFL star Terrell Owens as the star of a segment called “Super Bowl Party Prep With Terrell Owens”. Standing in a kitchen, surrounded by several people, he talks about how all kinds of smells, such as the smell of chopped onions, the smell of a stinky cheese platter, and more, can linger in your house during the party prep for the Big Game. Things take a dramatic turn, especially because Febreze was stuck in traffic and didn’t arrive to save the day. To make the situation even worse, a man tells everyone there to avoid entering the bathroom. Former Cincinnati Bengals wide receiver Terrell Owens was enlisted as a brand ambassador for Febreze air freshener in January 2018. Last year, P&G’s commercial for Febreze aired during the second quarter of Super Bowl LII, which took place at U.S. Bank Stadium in Minneapolis on February 4, 2018 and was televised locally on WLWT as well as other NBC affiliates. This year, the Big Game – which will see the Los Angeles Rams and New England Patriots facing off, will take place on Sunday, February 3rd, and will be televised by CBS and streamed on CBSSports.com and on the CBS Sports App.